And one Sunday afternoon, in a sunny atrium close to her hospital room, staff at Mayo Clinic made sure that she did. 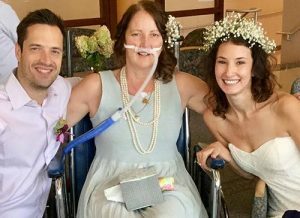 For a time after her diagnosis, it looked as though Amy would make it to Alison's wedding in November. "My treatments were all going well," Amy told us. But complications arose in late August, and Amy was admitted to Mayo Clinic Hospital — Rochester. Alison and her brother, Andy, were encouraged to make their way to Minnesota from their homes on the West Coast. "When I got to the hospital and spoke to her team, they were adamant it was a bad situation," Alison says. The team knew Alison's wedding was coming up and that she wanted her mother to be a part of it. It might be time, someone suggested, to think about moving up the wedding. "I asked how soon, and they said within the next couple of days," Alison tells us. She pulled one of her mom's nurses aside. "Do you think that could happen?" she asked. "A wedding in the hospital?" The response was simple: Absolutely. A chaplain was consulted and a blessing of the vows was scheduled for the next afternoon. "As soon as staff heard what was going on, so many people piped in and said, 'Well, I could do this to help,' or ask 'What can I do to help?'" Mallory Malone says. Malone, Amy's nurse the night before the wedding, tells us she and her colleagues spent much of their shift "brainstorming ways we could help Ali feel special on her special day and make a memory she could cherish with her mom forever." Malone found a bakery that would make a cake on short notice. Liz Turba, another nurse on the unit, went home during her break and brought back a dress for Alison to wear during the ceremony. Turba also offered to stay after her shift ended to wash and style Amy's hair before the wedding. "This situation really hit home for me," Turba says. "I recently got married and could not imagine my mom not being able to be there. I put myself in Ali's shoes and would have wanted someone to do all of the things we did for her and her mom. We wanted to make the best out of the situation and try to give Ali and her family the best experience possible." When fellow nurse Mara Kubisch arrived for her shift the next morning, she took over as wedding coordinator. Mary Truskowski, who was serving as charge nurse on the unit, covered some of Kubisch's nursing responsibilities to free her up to focus on the wedding. 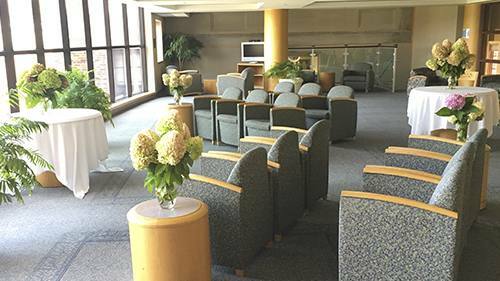 "We decided to have the wedding in the atrium right outside our unit," Kubisch says. Soon other details began to come together. A nurse went home during her break and cut hydrangeas from her garden to make floral arrangements. Another nurse, Joe Temeyer, volunteered to play guitar for the ceremony and spent about an hour learning "Somewhere Over the Rainbow," Amy's favorite song. Alice Gallo De Moraes, M.D., a critical care medicine specialist, offered to pay for the wedding cake and any additional expenses. Help came from other departments as well. Dietary staff brought coffee, punch, nuts and M&Ms to the atrium. The gift shop sent up additional flowers. Someone said they'd take photos. Extra respiratory therapists came in, on a holiday weekend, to help transport and monitor Amy during the ceremony and make sure other patients' needs were taken care of during the wedding. When Alison returned to the hospital after leaving to have her hair styled, she was amazed by what she saw. "When I came back, they had flowers, food, a cake, a photographer," she says. "There were an incredible number of staff involved. The level of compassion and care was beyond my expectations." With all the arrangements in place, it was time for that walk down the aisle. 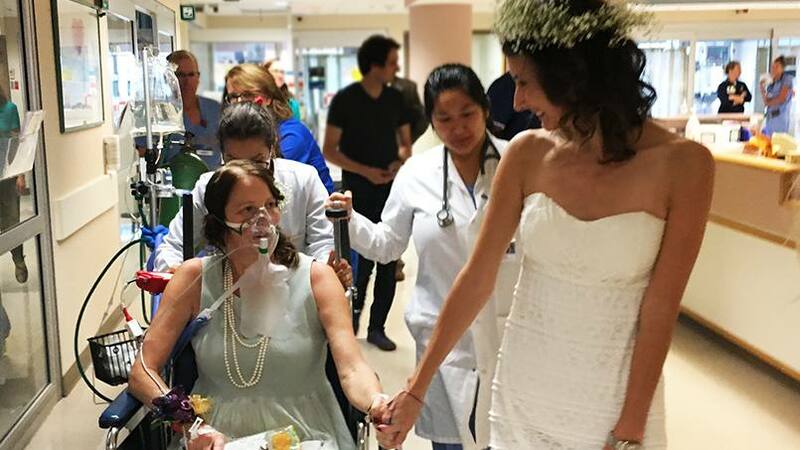 At 1:30 p.m., on Sunday, Sept. 3, Alison grasped Amy's hand and walked beside her from her hospital room to the nearby atrium where her fiancé, Peter Howell, was waiting, along with a few family members, friends and members of Amy's care team. Dr. Gallo De Moraes walked behind Amy, pushing her wheelchair and keeping a close eye on her oxygen levels. Two respiratory therapists followed as well, helping to transport the oxygen tanks and other equipment needed to keep Amy alive. "The ceremony was incredible," Kubisch tells us. The wedding bands the couple exchanged — which had once belonged to Amy and her husband, who passed away when Alison was a teenager — added an extra level of meaning. "Everyone was crying, staff included. It really showed you what a wedding is about. We had a grocery store cake and flowers from someone's garden. But the family was together, and that's what mattered." Especially so, perhaps, to Amy herself. "That so many people would go above and beyond who really had just met us is beyond compare," she told us. "I will never forget all the kindness, generosity of time and money, and just downright love and care so freely given to me and my family." Alison tells us her entire family is deeply grateful for the staff's efforts. 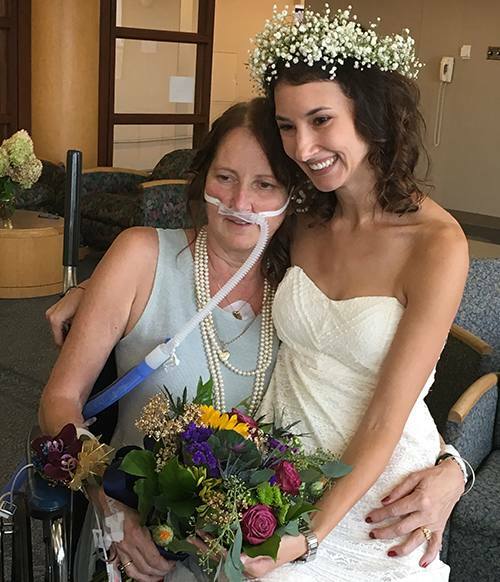 "We've written thank-yous and sent chocolates, but there's no way to say how grateful we are, not only for the medical care, but for taking care of my mom as a whole person," Alison tells us. "I work in health care, and have done a lot of things in my career to make people's wishes come true. I never thought I'd be on the receiving end of that in such an incredible way." Staff involved in the wedding say they feel honored to have been a part of something so special. They say their efforts were guided by their own version of the Golden Rule. "Amy's family probably won't remember my name, but they will remember how that day made them feel," Kubisch says. "They'll remember that we really cared about them. And that's what nursing is all about. It's about treating people like they're your own family." Dr. Gallo De Moraes agrees. "I care for my patients the way I would expect people to care for my parents," she says. "That is the spirit of Mayo Clinic. It's what we do." Editor's note: Amy passed away on Friday, Sept. 22, cared for by the same team that helped coordinate her daughter's wedding. "The staff on 6 Mary Brigh B helped us keep Amy comfortable and allowed her to die doing everything 'her way' right up until the end," Shelly Roberts, a Mayo Clinic nurse and childhood friend of Amy's, tells us. "We will be forever grateful to each and every one of them." Bless all of you for your care, compassion, and love! I was proud to be a part of this day. I had no idea what to expect. I was trying to get a dress, flowers and cake for Ali before the wedding and she called and said she needed to move up the time from 4 to noon. I jumped in the car nearly empty handed knowing her wedding would be very basic. I was so wrong! To walk in the atrium room and see the flowers, the food, the dress that fit tiny ali perfectly brought me to my knees! Thank you will never be enough! You have re-stored my faith in humanity! You have given us enough love and caring to help us through this tremendous loss. It’s like a hug that just keeps holding on! This is such a heartwarming story but does not surprise me at all. This is typical Mayo Clinic!! They really care about people! I was fortunate enough to work there for 20 years and saw beautiful things happen all the time ! This is part of what makes Mayo Clinic the BEST medical facilities in the world.